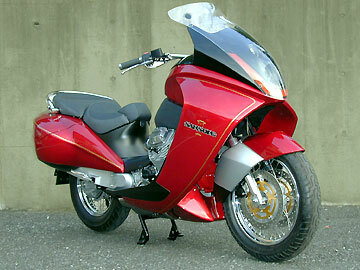 What do you call a very large scooter equipped with a 750cc V-twin Moto Guzzi engine? Samson, naturally. 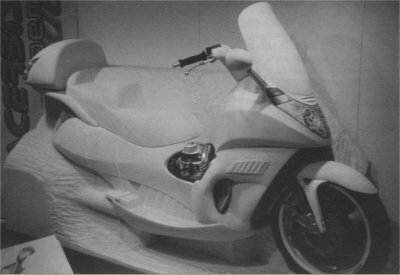 Actually, Italian design firm DSN call their prototype Sansone, which means the same thing but sounds more interesting. Apparently the intention is to demonstrate the route Moto Guzzi could take with future models under the ownership of Aprilia. According to those on-the-ball lads at Motor Cycle News, the company prefers not to use the term �scooter�, instead opting for �sport utility bike� � a reference to its use as a commuter bike and recreational transporter. 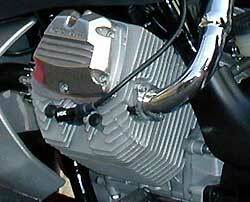 Power � and rather a lot of it � is supplied by the air-cooled V-twin engine from Moto Guzzi�s Nevada cruiser, coupled to a maintenance free shaft drive. We�re told the Sansone is a comfortable, maneuverable and practical machine, with a low center of gravity. 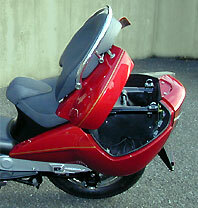 There�s enough room under the wide saddle to store two full-face helmets. Although the design study described by MCN features a rear-facing camera linked to a small monitor on the instrument panel (replacing rear-view mirrors), it�s likely that the production model (that is, if the bike ever reaches that stage) will feature more conventional equipment.